Since it’s important that you (or another you care about) receive the best care available for men, a dual diagnosis treatment at Windward Way can be the effective solution you’re looking for. Call our friendly intake staff now to find out how we may help you with your co-occurring disorder: 855-491-7694. Windward Way is committed to providing the best care for men, aged 18 to 45. In fact, that’s why we strive to offer an individualized treatment center for dual diagnosis by employing multiple, beneficial treatment modalities. As it happens, we’re extremely proud of addiction treatment program we’ve crafted specifically just for men. Rightfully so—the continual feedback we receive from our alums shows us that we know how to deliver when the rubber meets the road. Call us now to begin the process to reclaim your new life. We want to hear your situation and customize a plan, just for you. We’re here 24/7 at 855-491-7694. For most people, opening a can of beer or lighting a marijuana cigarette after a long and stressful day is the perfect way to relax and unwind. In some instances, these inhibitors help you calm your anxiety and become the life of the party. For other people, however, alcohol and drug consumption have become a burden they cannot escape. They feel the uncontrollable need to use substances to manage their mental conditions and function normally. When that happens, getting help is the most obvious step. However, most individuals are not aware that they are abusing certain substances to keep their depression, disorders, or anxiety under control. Nearly one in five adults in the U.S., meaning more than 18% of the adult population, suffers from a mental illness. In spite of the worrying numbers, mental health is still not taken as seriously as it should be. As such, people are not aware of the consequences mental illness can have on their lives and are rarely seeking help. A co-occurring disorder means that a patient has a substance abuse problem as well as mental health issues. However, not every person that uses self-medication to treat their depression, for example, can be diagnosed with a co-occurring disorder. A team of specialists needs to assess the person’s condition, examine the symptoms, and determine whether or not they need to pursue a dual diagnosis. What Are the Addiction Rates Among Those with Mental Illness? 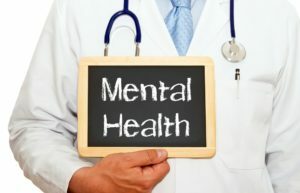 With the increasing number of people with a mental illness, more and more studies are beginning to look into the connection between addiction and mental health. Recent reports have shown that those with a mental illness are 38% more likely to consume alcohol, 44% more likely to take cocaine, and 40% more likely to smoke. The numbers are even higher in the case of people who experienced a serious mental illness in a given year. Studies are still inconclusive and have yet to find a direct connection between mental health disorders and addiction. As such, it’s difficult to say right now if one causes the other, especially since each patient’s story is different. There are instances when a mental condition becomes such a burden that the only solution people can think of to escape its effects is alcohol or substance use. In other cases, people have been addicted for so long that they have developed a mental disorder, such as depression or anxiety. What Gets Treated First, Addiction or a Mental Health Disorder? Although there is no standard treatment for co-occurring disorders, it’s paramount to treat both conditions together. The first step is to stabilize the patient, making sure they’re not a threat to themselves or those around them. Then, the therapeutic team must create a personalized treatment plan based on the person’s current mental health, his or her social needs, goals for recovery, and post-recovery, and any underlying threats that can jeopardize the person’s sobriety in the future. A detox will be, in most cases, the next step after stabilizing the patient, as it can help them deal with withdrawal symptoms. A detox treatment also plays a crucial role in managing the psychological and emotional issues that led to addiction and the mental health disorder. Who Is Qualified to Treat Co-occurring Issues? Co-occurring disorders require the attention of a team of specialists that work together to create a personalized treatment plan for the patient. Moreover, the team should carefully monitor the patient to make sure he or she is responding well to the treatment and making progress. It’s paramount that the therapeutic team includes therapists, physicians, behavioral specialists, and so on, to develop a holistic treatment that takes into account more than just the physical effects of the addiction but also the psychological ones. A mental health disorder diagnosis can be difficult as it is. Couple it with an addiction and the path to recovery becomes even more arduous. But that doesn’t mean that you are without hope. Admit that you need specialized help and seek the support of a rehabilitation center and give yourself a new chance to a better life.